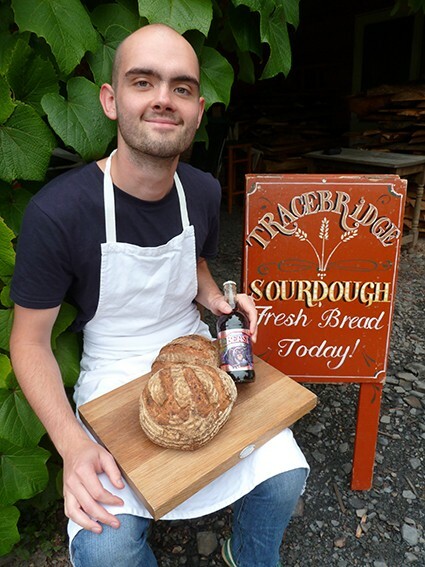 A collaboration between Wiveliscombe brewery Exmoor Ales and neighbouring Tracebridge Sourdough bakery has created a delicious new beer bread to be launched today, Sunday 7 September, at the Wiveliscombe Street Market. The ‘Wee Beastie’ is the invention of Tracebridge Sourdough’s baker Adam Lawrie using the popular Exmoor Ale’s Exmoor Beast. It’s a 600g dark wheat and barley sourdough boule with a pleasantly chewy crumb and malty flavour from the porter style Exmoor Beast, and slashed by the talons of the beast itself! The bread will be available for tasting on both Exmoor Ales and Tracebridge Sourdough’s stands at the Street Market today. The loaf will be on sale each Saturday at the Wiveliscombe Farmers’ market, Tracebridge Sourdough’s only outlet for their breads and pastries. The market, which has been running for just over a year, is a finalist in the Somerset Life Food and Drinks Awards 2014.